Flour, Yeast, Salt, Water & Time. . . Breadasana! There are few things that I love more than yoga, but cooking is one of my other true passions! 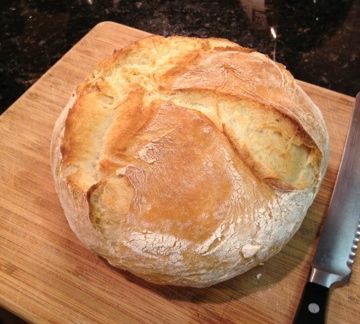 Baking homemade bread is one of my favorite meditations. The smell and taste are intoxicating! However, pick up a book on bread baking and one can get a bit overwhelmed by the shear enormity of flour and time required. So I was truly excited years ago, when I discovered Jim Lahey’s (founder of Sullivan Street Bakery) method of producing quick, no fuss, minimally laborious rustic bread. This method has made bread making much less intimidating and has since been adapted by Mark Bittman to be even faster when needed. Just this past week, I had the privilege of taking my daughter to hear Mark Bittman speak at Indiana University. He was asked, what one thing could a person do to make an impact on our food system and culture? His answer was simple. Cook. His answer was brilliantly simplistic and possibly a disappointment to those who wanted a call to action that would involve organizing, legislating or protesting. Cooking your own food is not unlike the call to action in yoga. Both require that we look inward and take personal responsibility. We tend to want a magic pill, someone to tell us how we can be happier, feel better and be stronger. If you want to make an impact on the current food system, stop buying things that aren’t real food for the sake of convenience and time. Start buying or growing the best food you can afford and prepare it yourself. Below are the two recipes. . . 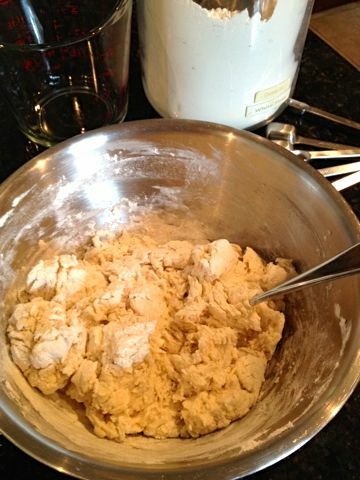 Mix together the flour, yeast and salt, then stir in the water. Preheat a glass casserole or iron pot with lid (note: if using Le Crueset, the interior can discolor at high heat) in the oven with lid on at 475 degrees for about 30 minutes – you are making an oven within your own oven. (Don’t stress about this either, my friend uses a heavy duty glass bowl meant to withstand heat and a lid from another pan that fits tightly). 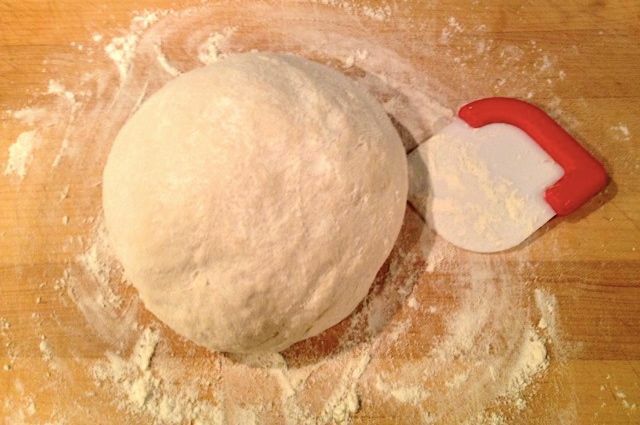 Once the oven and pan are preheated, you can begin to transfer your dough. You can use a dough scraper to aid in the transfer to the hot pot or the towel you covered it with. Place the dough gently into the hot pan – being careful of the hot sides – and re-cover. Bake on 475 for 30 minutes. Remove the lid and continue to bake another 15 – 30 minutes depending upon how dark you like your crust. The longer you bake, the crispier and crunchier the crust. Be careful not to burn. Once baked, remove from pan with a towel or mitts, place on a rack to cool. You may notice a cracking sound called “singing” as the cool air hits the bread and some expansion occurs. This is a fabulous sign! Allow the bread to cool before slicing. *NOW FOR THE FUN PART. . . EXPERIMENTING! I have found either method to be rather fool proof! Be adventurous – you can use bread flour or plain white (which I found worked well in higher altitudes). I often use a blend of flours; organic white, wheat, barely, oat, rye, cornmeal etc. Remember with the heavier flours, a 2:1 or smaller white flour to darker flour ratio is helpful to keep the “crumb” (texture of the bread) from getting too dense and heavy. I often include some sort of natural sweetener when using the darker flours. A few tablespoons of molasses or honey mixed into warmish water to dissolve will add dimension and flavor. It also feeds the yeast, which lightens the loaf a bit. Dried fruit such as cherries, dates or raisins go well. If you add dried fruit during the first rising, remember they will reconstitute a bit. If you prefer, you can add the fruit when you turn the dough out the first time. I have also used half water/half buttermilk, roasted garlic, herbs, cheese, cinnamon, nuts and various seeds. Of the hundreds of breads I have tried only a few did not turn out beautiful! So go forth and create some of your own breadasana!